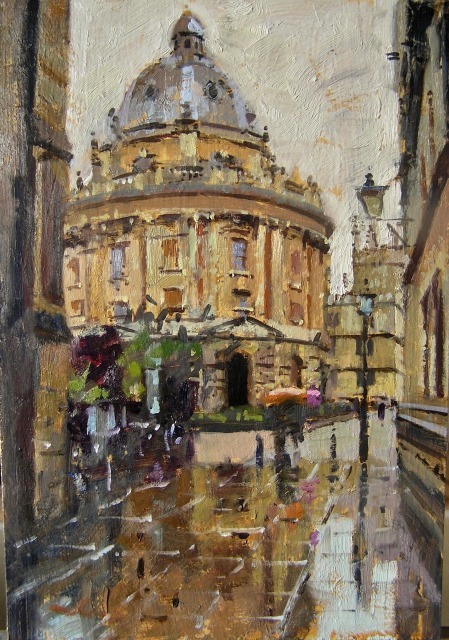 Bruce Yardley has been a full-time professional painter for over twenty years, working exclusively in oil and firmly within the English impressionist tradition. His subject matter embraces cityscapes, interiors, and still life. Each year he travels to continental Europe in search of subject matter, most frequently to Italy (especially Venice), but also to France, Spain and Portugal. Back in England, London is a favourite subject, so too the interiors of his own Georgian home in Bath. Uniting all his work is a fascination with the varied effects of light, whether it is the crisp, low sun of an English winter, the cushioning glow of the Venetian lagoon, or the sparkling duplications of wet reflections and polished tabletops. His paintings range in scale from small alla prima oil sketches executed on board to canvases of four foot and more. Bruce is the son of the painter John Yardley.